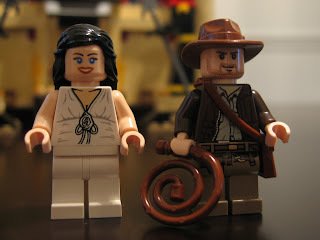 I recently picked up the Indiana Jones Lego set where Indy and Marion are in the Well of Souls (From Raiders of the Lost Ark). It's a pretty decent little set, with a low price point. As usual, Lego's Candian pricing is crazy, but it was on sale so I got it at a fair price. This small set basically represents the Well of Souls, including a bunch of snakes, and the Ark of the Covanent. In a stunning departure from the movie cannon, the Ark is still present while Marion and Indy try to free themselves. 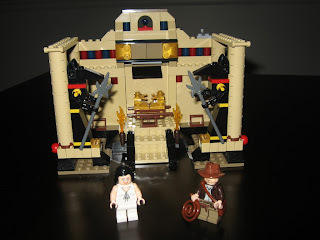 As far as playability goes, the set offers a few tricks; the Marion minifig has two faces, one happy and one sad; the back wall of the tomb has a snake-dispensing trap, and the Egyptian statues can be toppled over, breaking through the back wall of the tomb (which are held in place with only a single stud for easy destruction). Overall the quality of the set is good, though I would have liked a couple more minifigs (where's Sallah?). My only complaint is the use of stickers for the Egyptian art motifs. One of the stickers offensively covers two separate pieces, which means it will tear in half or get pulled off at some point in the future. I didn't apply that sticker. Also, some of the stickers (especially the eyes on the statues) aren't really necessary to get the full enjoyment from the set. Piece-wise these are useful parts, in tan and that new brown colour that's the colour of chocolate milk. 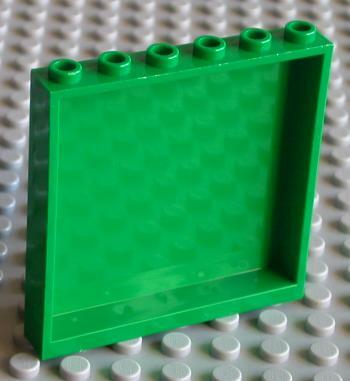 I really like the colour and this set has two baseplates that use it, as well as a few tiles. The normal tan pieces are also very useful and I was pleased to see that the pillar was made up of lots of individual round bricks instead of the less-useful one-piece pillar. I also noticed that the wall pieces are now hollow in the back, instead of solid like regular bricks. That's fine for most building but it's annoying in general that the pieces are getting a bit cheaper. Overall I rate this set highly. It's a cute little set and you can't beat the Indiana Jones minifig. I recently installed Fedora 10 on my media PC. That was the hardest Linux installation I've ever done... until now. Just when I thought Fedora's installer couldn't get worse, it did. The problems begin when Fedora's installer doesn't know how to start graphical mode on my media PC. You'd think that by now a computer connected to a TV would be one of the things that just works, but sadly, it doesn't. Even the basic VESA driver doesn't work for me. My TV output works fine with the nVidia binary driver, but I don't think there's a way to install the nVidia binary driver during installation, and thus I have to use the text-mode driver. Install in the "Free Space"
Well, using the whole disk is out, and using the Free Space is out because I have no free space, and upgrading is out because I want to keep 10 working until I am sure 11 is ready for me to use. Where is the option to repartition? It was at this point that I should have turned back, but I decided to tough it out. I switched to the second virtual terminal and manually deleted my unused Fedora 7 partition using fdisk. "That should do it," I thought. WRONG. 28GB wasn't enough space to install, according to the installer. So I grudgingly deleted my Windows XP partition, which was unused on that computer. This freed up an additional 120GB and then the installer was happy to continue. The installer asked me one more question: "What is your root password"? After typing that in, it said "Making filesystem... done. Installing software... done. You may reboot." 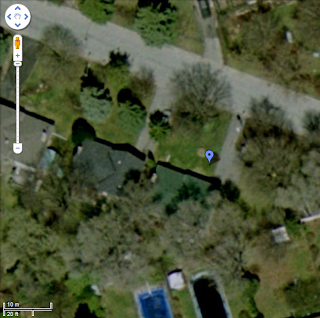 Where did my network setup go? Where did package selection go? Ok, well... maybe the installer is two-stage and a second installer will start after I reboot? Nope. Turns out that's all there is: The installer installed the base packages and nothing else. Well, I guess I can set up my wireless network card now... nope, wireless networking packages were not installed. Ok, let me start the X gui: nope, X isn't installed. Hm, let me install software: nope, the yum command-line tool doesn't know how to install from the DVD. left me with a system that had no network and no way to install software from the DVD. And even though the installer knows I have a Fedora 10 installation that I didn't overwrite, that I took great pains to protect, it didn't set up a grub entry for it, so the system only boots into Fedora 11 and doesn't offer any other choices. Maybe the graphical installer would work, but the only monitor I have for this computer is a TV (my other computer is a notebook). Maybe I could use the VNC install, but the wired network is in a different room from the TV, so I can't see what I need to type to set up the vnc install. And the worst part: The text-mode installer doesn't explain, at any point, what it is doing or what other options you have. A single help screen, saying what the text-mode installer was capable of, and notifying me of the fact that I am out of luck using this installer, would have saved hours of aggravation. So far I've managed to get things working bit by bit by moving the computer to the room with the wired network, typing blind to log in and active the network card (why isn't it on-boot? sigh), and then ssh'ing from my notebook into the computer. At that point I can at least install packages from the network and see what I am doing. But it should not be this difficult! I've been using Linux for 12 years and it seems things have started getting harder, not easier. One thing I've found tricky to learn in Chinese is the numbering system. Every language has their own way to name the numbers and numeric concepts, but Chinese is the strangest to me. First of all, there are no distinct words for numbers bigger than 10 (十), until you get up to 100(百), 1000 (千), etc. This makes it easy to remember but conversely more confusing to hear for me. For example, the word for "twenty" is actually pronounced as if you were saying "two ten" (二十) in English. But this means that a word like 74 is prounced "seven ten four" (七十四). This is fairly logical and easy to understand, but because I'm still getting used to this I have to first hear the individual numbers and then recombine them in my head to form their actual values. It gets harder as you get to larger numbers. First, there are words for 100 and 1000, but there is also a word for 10,000 (万). 100,000 is ten-tenthousands (十万). This means that you have to group numbers by 4 digits instead of 3: The number 300,223 isn't "three hundred thousand two hundred twenty three", it's 30'0223 - "thirty ten-thousands two hundreds two tens three" (三十万二百二十三). This makes it hard to convert the numbers unless you've totally internalized the different representations. Oh, and you usually don't use er2 (二) to say "two something", you have to use liang (两). So if you want to say "Two dogs", you don't say er zhi gou (二只狗), you say liang zhi gou (两只狗). Then there's the convention used for talking about discounts. In English we often talk about how much on sale something is: 25% off, for exmaple. In Chinese you say how much is left to pay: da qi zhe (打七折) would be "on sale for 7 tenths." That means it's 30% off. If you want to say 25% off, you'd say 7 tenths 5, or da qi zhe wu (打七折). As far as I know, you can't sell something for more than 90% off: 90% off would be da yi zhe (打一折), or 1 tenth, but you can't say da ling zhe jiu (0 tenths 9)(打零折九).